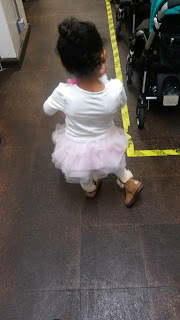 Yen loves to dance especially ballet, so I did some research on decent ballet classes that are not too far or expensive and it also had to be either a weekend or on my day off. The classes I found usually start from 3yrs upwards but I found a brilliant one. It wasn't too far or expensive for the term (£75/term) AND they had classes on my day off AND they offered a free trial lesson RESULT!!!! I emailed the lady and she emailed back fast which was brill. So the day came and Yen was soooooooo excited she couldn't wait to start. I loved how the teacher taught, she was polite and made Yen feel very welcomed. I loved her style of teaching it made it more fun. When the 30min session ended she gave out stickers and Yens sticker was for doing so well for her first lesson. Yen didn't want to go home, I asked if she wanted to go again she said yeah so I booked her in for the term woohoo!!!! !